I was going to comment on Chris’s hair and teeth (not your hair Fee - which looks just fine) but Fee got there first. Oooh I have to - Has Chris got a wig on and false teeth in? Out of interest where did the expression to “pick up” come from. Cause when it comes to lasses I very rarely do that and when it comes to campervans even less so. Also I got a postcard from my aunt with regards my mum and in it she stated that my mum had “got off with the tour guide in the church”. Tis a funny language english. Hurray, you finally got to cuddle your Koala, well done Fifi Le Flint! His claws look a little sharp! 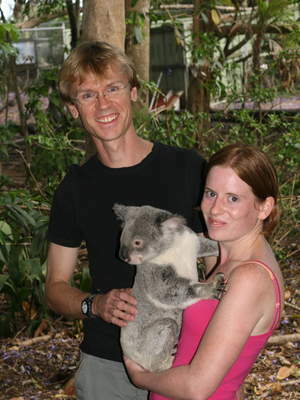 I know koalas are not bears, but that is their name (well, perhaps used to be I don’t know!). Their claws weren’t too sharp, although I was a little concerned about that myself, given my sparse clothing. Oh, and yes I did wash my hands like a good little girl! Couldn’t get to see the photo on the website that you sent, but then they are out to sell the photos, not let you see (or download) them for free! So have had to resort to saving a copy from the blog and printing it out, though quality suffered somewhat. I seem to recall that Koalas have a somewhat pungent breath, due to the Eucalyptus that they eat. Did you notice it? No, I didn’t notice any smelly breath, although another side effect of eating eucalyptus is getting stoned, so she was quite chilled out, although I did worry slightly as she turned to face me (her face was rather close to mine!). Oh, and did I mention her name was Theresa? Sorry, think I forgot that vital information before.